Well after a short (or long) intermission, I am back in the blog-sphere. I, like most creative types, am a PACK RAT. I have this compulsive desire to save everything, as it might come in handy someday on a future on project. But I had a break through last weekend. I was actually able to go through my apartment and bundle up several garbage bags of clothes, papers and random items either to be donated or thrown out. I must say, it was very freeing! So yes, I'd like to say "My name is Melissa, and I am a recovering Pack Rat". After saying good-bye to alot of garbage, I was granted some free time to paint. 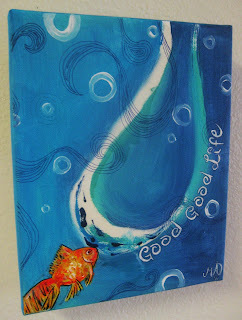 Thus, you have the painting above, "Good Good Life". This title of this painting was inspired by one of my new favorite bands, One Republic and their song "Good Life". Its just one of those inspirational songs that makes feel good, light hearted, have fun singing, and of course is great painting music. It serves as a little reminder to get rid of all the 'trash' in lives, and just enjoy the simple things. No matter how terribly, horribly, painfully difficult life can get, we always have something to be thankful for. And that something reminds us that we all have a potential to enjoy a good, good, life!